No need to adjust your screen, yes I am serving you bread with a green tone. Green bread! Weird, I know, but don’t let the color fool you, this is the most moist delicious bread I have created in a long time!! Whats in it to make it turn green? Avocado and Zucchini! I wanted bread that I could use up my zucchini and I wanted bread that contained healthy fats, not butter or oil, so in went the avocado. Basically I call this bread, everything but the kitchen sink bread! My Husband who doesn’t like avocado or zucchini was terrified to try it. I told him to try it and he said later. I went to take my shower and I came back and half the loaf was gone. I asked did you touch my bread? He he Yes he said, I had a few pieces. He said it was really good and the flavor surprised him. He said he liked that the blueberries popped in his mouth. He said he never had such plump blueberries before. I told him that’s because it’s Trader Joe’s blueberries. He just shook his head. This recipe makes one big loaf or two fat mini loaves. I actually had a pinch of batter left over, I couldn’t fill my bread pans any higher. 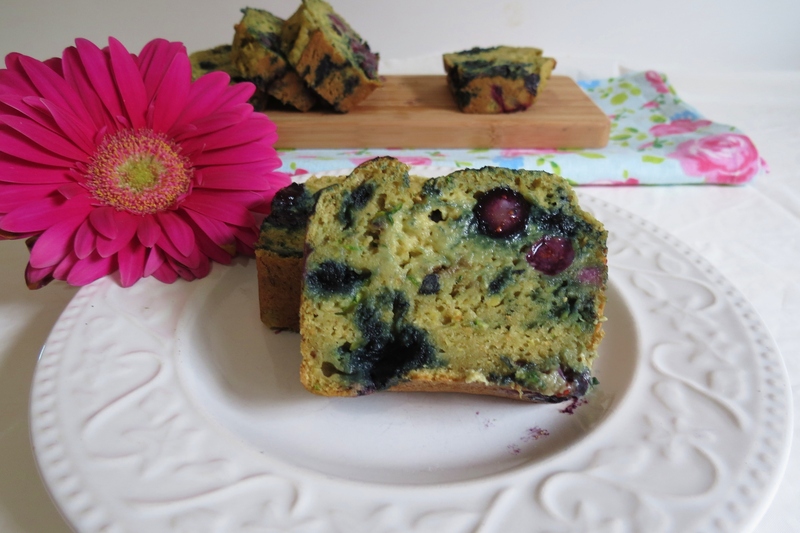 This recipe is made with fresh blueberries, one ripe banana, one avocado and a little bit of brown sugar. I tried to make it as healthy as I could. I’m pretty happy with the nutritional stats of the bread. 12 FAT slices are only 107 calories. Yes I’ll take two pieces please, and that I did. 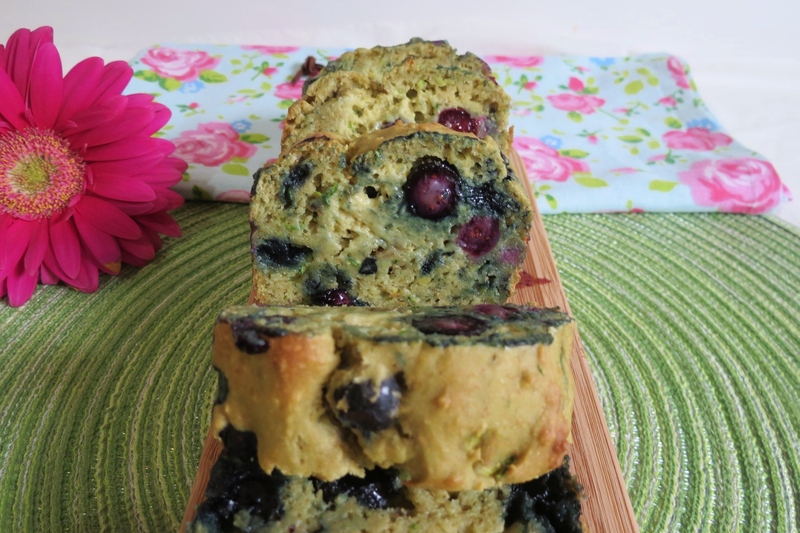 The flavor of this bread is sweet, moist and you don’t taste the avocado at all! You do get a slight taste of banana and honestly I barely tasted the zucchini. It kind of got lost in the bread. The blueberries are amazing. They do pop in your mouth and they stain your hands. After making the bread my fingers were blue. I really like this bread and I love the idea of using avocado in it! I will be doing that more often when making quick breads. if you never tried avocado in bread, you must try it!! 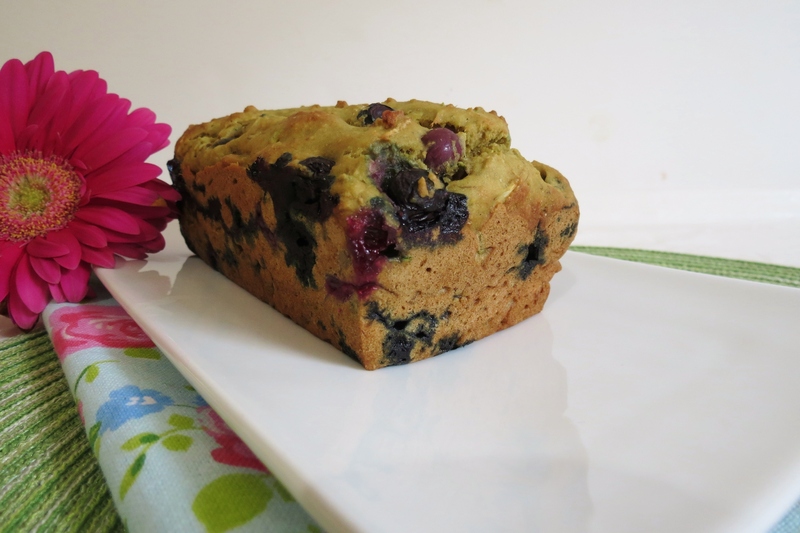 A moist healthy bread with a slight taste of banana and fresh blueberries. In a large bowl combine flours, baking soda, and salt. Make a well in the center of the bowl, set aside. In a medium bowl, combine: Egg whites, Banana, avocado, zucchini, brown sugar, stevia and vanilla extract. Add banana mixture to flour mixture, stir until blended together. Pour the batter into greased baking pans and bake for 45 to 50 minutes for large loaf, 30 - 35 min for mini loafs or until a toothpick inserted in the center comes out clean. Time to go fold laundry! Do I have any volunteers to help me? Out of all the household tasks that is one of my least favorites, next to doing dishes. This looks fantastic!! I actually have no idea how to mash an avacado….what could I use to substitute it instead? Hi Samantha! If you want to use an avocado, let it get ripe (turn black) and kind of soft, but not to soft. Then mash it like you would a ripe banana. Other wise I’d use coconut oil or canola oil to sub for it, maybe a 1/4 cup, but I’m not to sure to be honest. Or maybe a quarter cup of soft butter. It sounds Lovely! Yes…maybe a but weird too with the avocado, but I like trying new things so why not this:-) great inspiration!! Thanks! It’s a weird combo but works out well!! Love your bread you posted today!! That’s so funny that you husband gobbled up the whole loaf! I’ve never heard of avocados in bread, always learning something new! I can’t get over how well avocado goes in bread! It really is the most moist bread I ever had! My Husband took the 2nd loaf to work and ate the whole thing for breakfast! Gorgeous bread! I’ve used avo in so many desserts but never in bread-making — must try it b/c it looks sooo moist! It is so amazingly moist it’s crazy and you don’t even taste the avocado. If you do try it let me know what you think! Thanks Kammie, those blueberries do pop! Ahh husbands-mine would totally do the same! Though he would probably blame the kids on eating half the loaf 🙂 I really need to try avocado in bread. You always have the best making ideas! Ohhh thanks Laura! 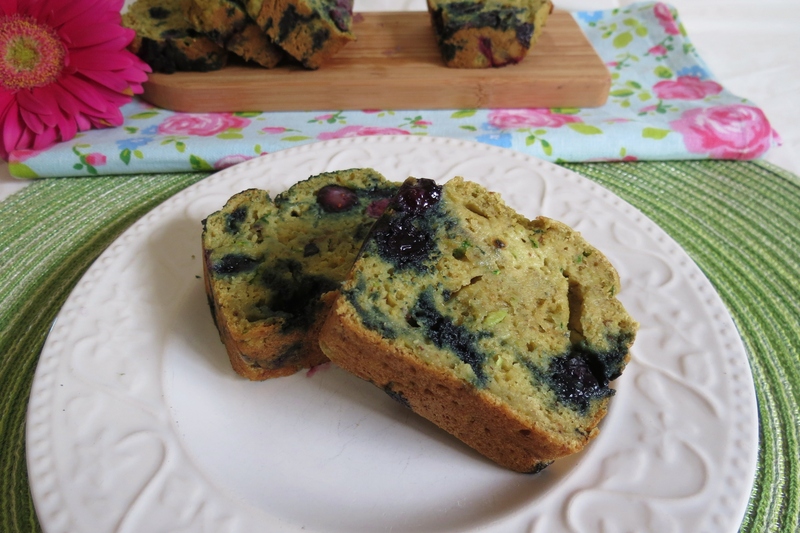 This bread really surprised me and I think it did my Hubby too! This sounds wonderful! I love how you used avocado! Thanks! I was surprised how well avocado went in bread! I’ll be using again in another bread recipe! 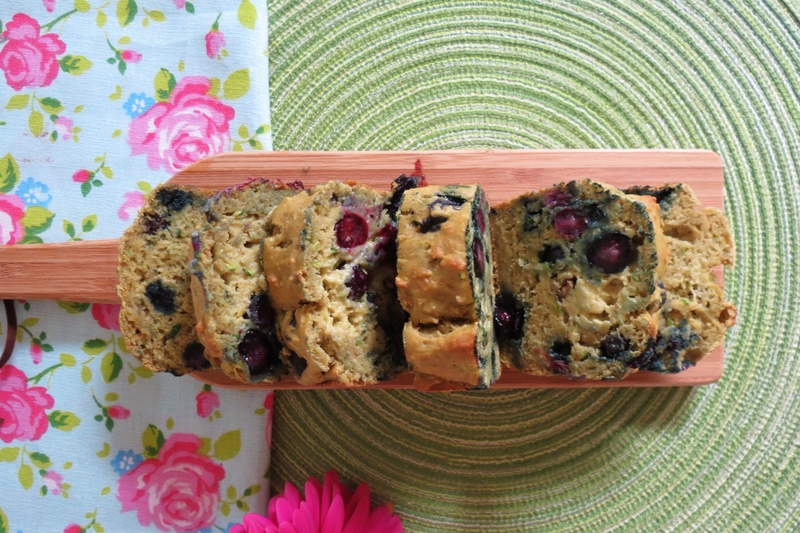 I love the combination of fruits and veggies in this bread! And the blueberries do look like they would just pop 🙂 Delicious! That’s so awesome!! Avocado in bread!! Yum!!! Thanks! I was pretty impressed with it! So moist it’s crazy! I’ve never tried Avocado in bread …sounds fantastic!! Thanks, me neither and i can’t believe how good it was! 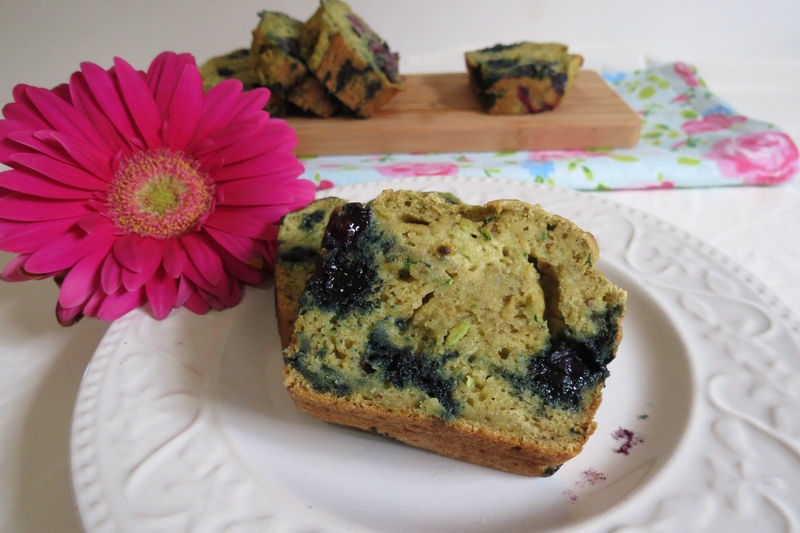 This looks amazing!I have never baked with Avocado, but I have seen so many people do it. I have to try it someday! It took me a while to be brave enough to do it, but I am glad I did! It’s incredible!! I am making this Monday (right after I buy groceries) for sure! It looks and sounds so so good! Thanks for sharing! Let me know what your think of it! I think it is so good! Wish I got more then one slice! My Husband devoured it! Oh I am so glad you liked it! It’s an crazy recipe but it all goes together so well!! Yah! I am so happy!! This bread is so incredibly delicious!!! It just finish cooling and I got my first taste and it is wonderful. I was so excited to make it and it exceeded my expectations. I am a carbalcoholic and this healthy alternative to fatty breads satisfies my cravings. Thank you so much! 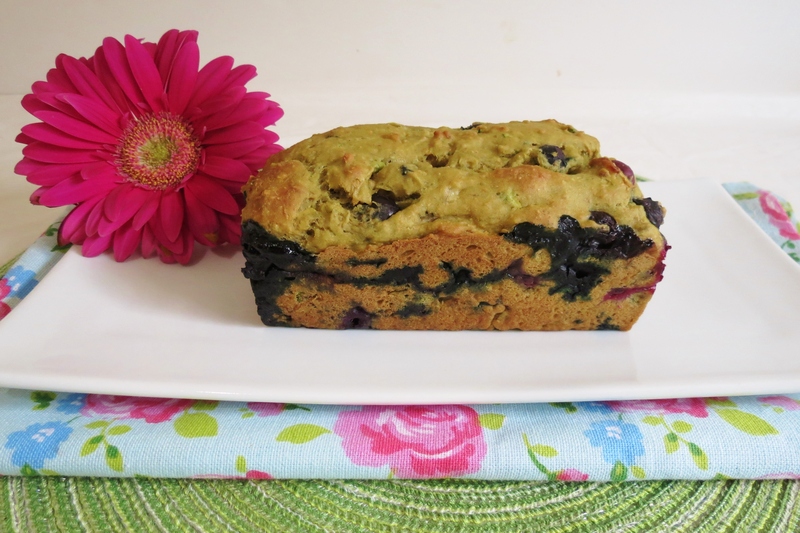 Jennifer, this bberry avocado loaf looks very interesting and I would like to try it. About how much banana would you say is equivalent to a large banana? Thanks for your help! Hi Janice! I would say about 1/2 cup should be good!! A little more or a little less will be ok in this recipe! Bravo! To eliminate the oil with an avocado was a wonderful idea. They’re not too sweet, but moist….just perfect & delicious! i have all the ingredients but am missing zucchinis 🙁 do you think it will still work?should I make any modifications to adjust for that? i’ve tried your recipe the proper way a few times before and love it each time! i haven’t tried it without the zucchini, but since there is so much moisture in the bread, I am sure it will be ok without it Let me know how it turns out. Is there a reason only egg whites are used and not the whole egg?